THE FIRST TIME I'm beauty blogging from our new home. If you've been wondering where I've been, I've been exhausted. If you read my other blog, you'll see what I mean. My hands feel like sandpaper now, after washing them too much. Which reminds me, I have to get a heavy-duty hand cream. Bourjois 1,2,3 Perfect CC Cream #32 Beige Claire ~ Too soon to tell if it'll rock my world, but I like the finish & light-medium coverage. MAC Vegas Volt Lipstick (Amplified Creme) ~ I will post proper swatches of this. Ardell Individual Short Lashes ~ Forgot to include these in the pic above, but you can check them out in this post. I wore 4 of them on the outer corners of each eye. 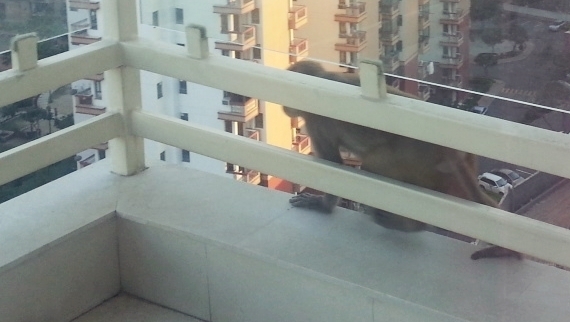 THE FIRST TIME a Monkey almost gave me a heart attack! Imagine this: I was all alone the first evening we moved into the new apartment....I was in my room, sitting on my ankles, taking out stuff from a suitcase on the floor....and then from the side of my left eye, I saw a monkey taking a stroll on the balcony right outside my door, only about 4 feet away from me. A lazy gait, almost like a catwalk, and it looked like it was chewing gum. I shakily muttered "Oh, Dear God. ", and then like National Geographic, I ran closer to the door mobile phone in hand, finger on the camera icon. I need proof, for whatever/whoever, I don't know. Seeing this, I think even Bandar (Monkey) almost had a heart attack. It gave me a horrified look before jumping down onto the balcony under ours. I didn't get a picture yet. It was only after a few minutes that he reappeared, but he jumped down from the balcony above ours (how he got up there so quickly, I don't know!). Hope it never comes again. I find baby monkeys cute (from afar), but the medium & grandpa types freak me out. I see a monkey, I immediately think of it jumping on my head & slapping my face senseless. Makeup & Monkey stories over. hahah..you look cute!! one of my cousins is monkey obsessed. She loves them to the core!! I don't understand her obsession et al..I really like your new place..I love how you have decorated your makeup room!!!! Love the look. And the monkey thing is hilarious! Hahahahaha. Wow Cynthia, beautiful as always! You amaze me everytime :D. Monkeys freak me out too lol. Love the hair and Vegas Volt is my all time favorite lipstick of all time from MAC after So Chaud ^_^. I really need to get my hands on the Bourjois CC cream now. You have a great skin...freshh and pleasant!! Lovely FOTD! Beautiful as always...cz u rock! I too stay in Gurgaon and am really happy that u have shifted here...hope I will get a chance to meet u sometime soon :) Dear some of the areas in Gurgaon really have this monkey prob so please beware! Thank God our society guards always keep a check. If you don't mind can I ask in which phase/sector have you shifted? Huh?! I'm not sure I get what you mean Nivedita :D YES Bourjois is always tempting! without a second thought u r looking so cute n pretty..I also like the backdrop of the first pic. I love your make-up in this post and the lipstick you're wearing *drools* I have to get my hands on it, such a gorgeous shade! My most favourite part of the post is the monkey! Like, I have a million questions?! Hi !! Fun blog you got ! !